Jeffrey Daxe joined Moore Ingram Johnson & Steele in 1997 and is a partner in the firm’s Litigation and Employment Departments. His prime areas of concentration are in employment law and business litigation, as well as HR Consulting. Born in Augusta, Georgia, Jeff was admitted to the Georgia Bar in 1997 after receiving his J.D. degree from the Washington University School of Law in St. Louis. Jeff graduated in 1994 from the University of Virginia with a major in History. 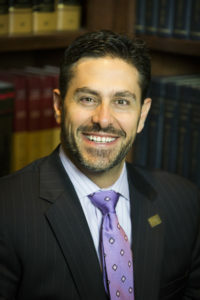 He took a Judicial Clerkship in 1996 for Chief United States Magistrate Judge for the Eastern District of Missouri, Judge David R. Noce, and also completed a summer internship in the United States Attorney’s Office, Civil Division, Atlanta, Georgia. He is a member of the Cobb Justice Foundation, the Cobb Bar Association and is a former Chairman of the Board for Vision Rehabilitation Services of Georgia. Jeff, his wife Stacy, son Taylor, and daughters Mia and Emma, live in Smyrna where they enjoy community events, Braves baseball, cooking, golf and skiing. 2015 Richard L. Moore Volunteer of the Year Award winner, presented by the Cobb Justice Foundation and Legal Aid of Cobb County.